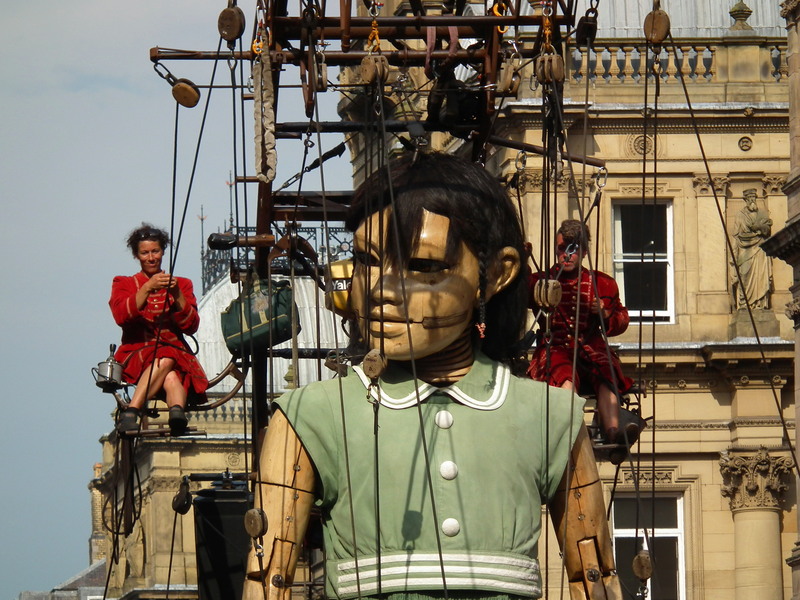 In my previous posts, I’ve mentioned the work of Jean-Luc Courcoult’s Royal de Luxe, whose magnificent marionettes have toured the world and which I’ve had the joy of seeing in Liverpool for the centenary of the sinking of the Titanic and also the city’s WW1 centenary commerations. 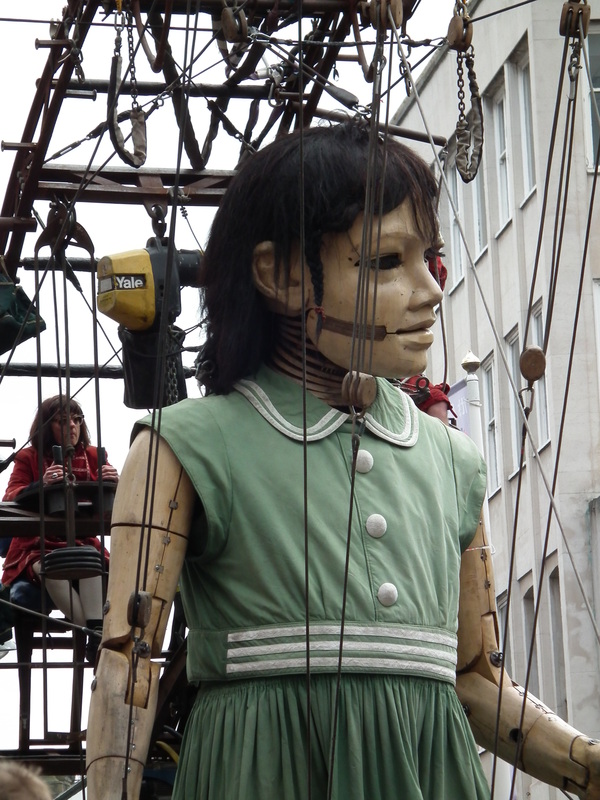 I’ve long hoped to visit Nantes (north-west France) to see Les Machines de l’île (“The Island of Machines”). 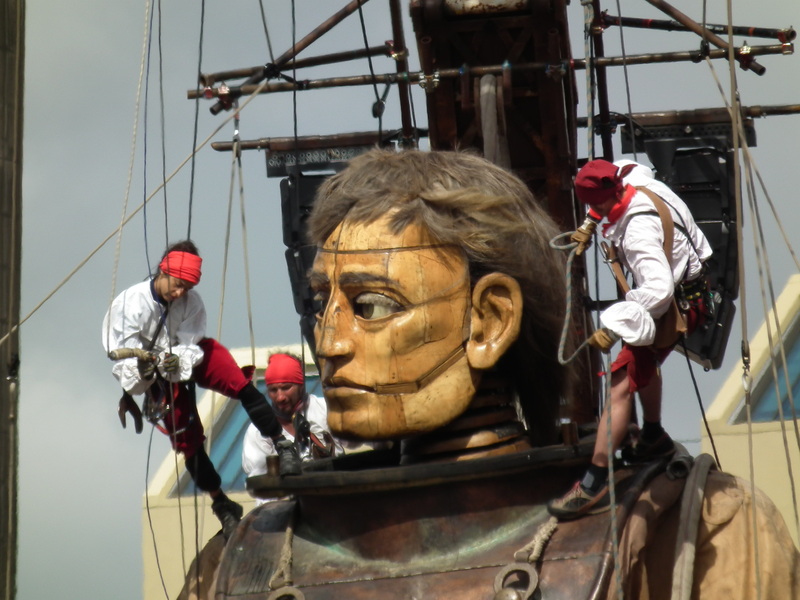 It’s the brainchild of Pierre Orefice and ex-Royal de Luxe designer François Delarozière, housed in a former shipyard. 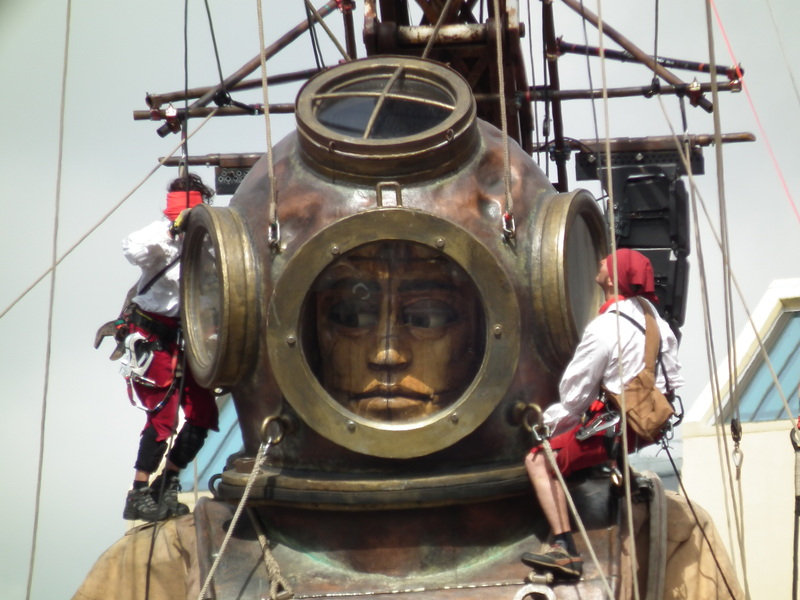 Their website describes their work as Leonardo da Vinci meets Jules Vernes (who, incidentally, was born in Nantes). It was as marvellous as I’d hoped. 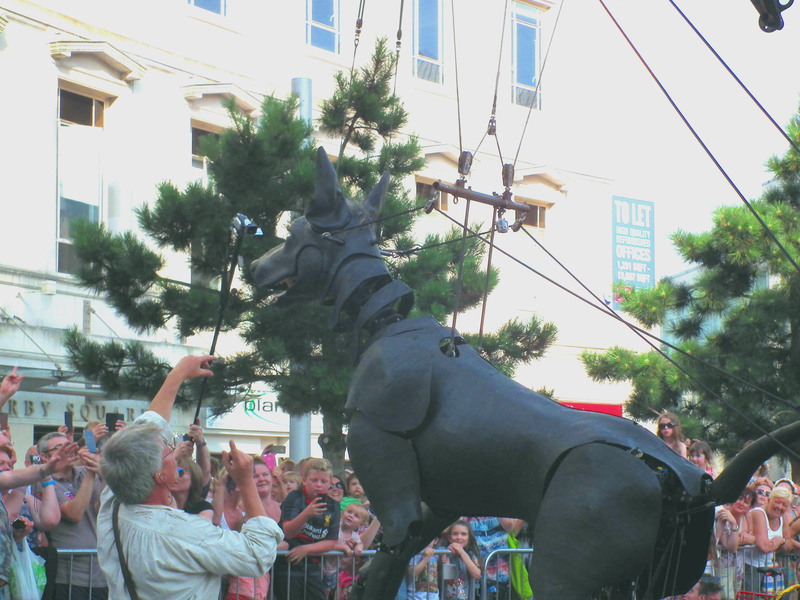 The site features 3 main projects, the Great Elephant, the Marine Carousel and the Machine Gallery which contains prototypes for the Heron Tree. 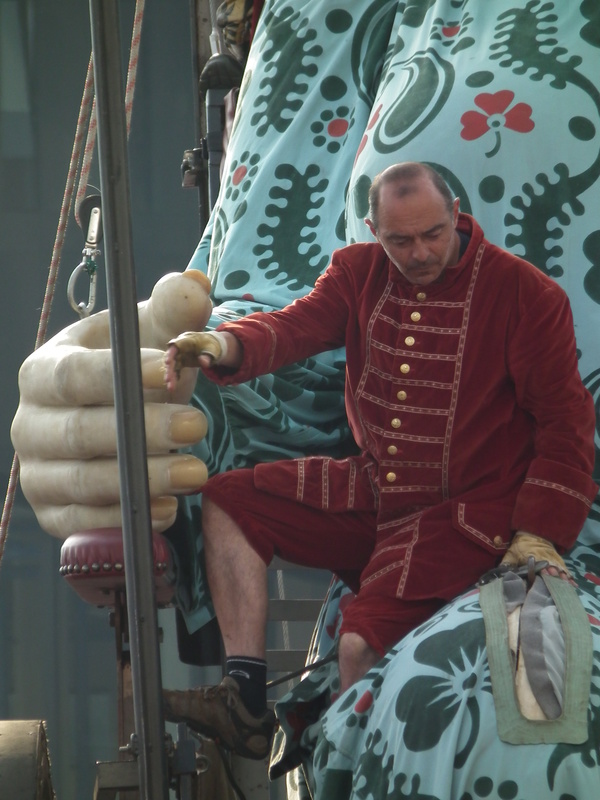 The Marine Carousel is on 3 layers- the sea bed, the abyss and on the sea’s surface. 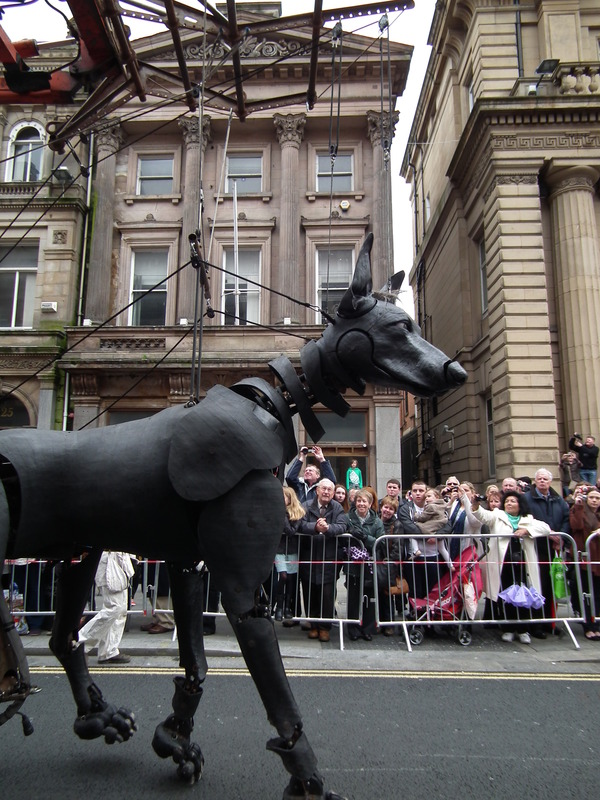 Each creature is designed to be sat on or in, with moving parts that the rider can work like a puppeteer. The Heron Tree promises to be an awesome feat. 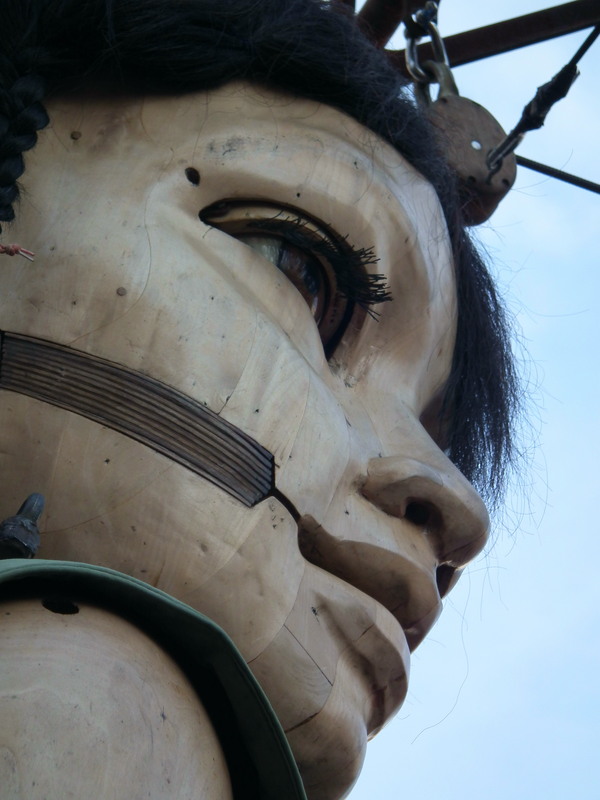 It’s due for completion in 2018 and will be 55 metres in diameter and 35 metres high. It’s a steel structured tree to be sited on the banks of the Loire river in Nantes, some of whose branches will reach out over the river itself. 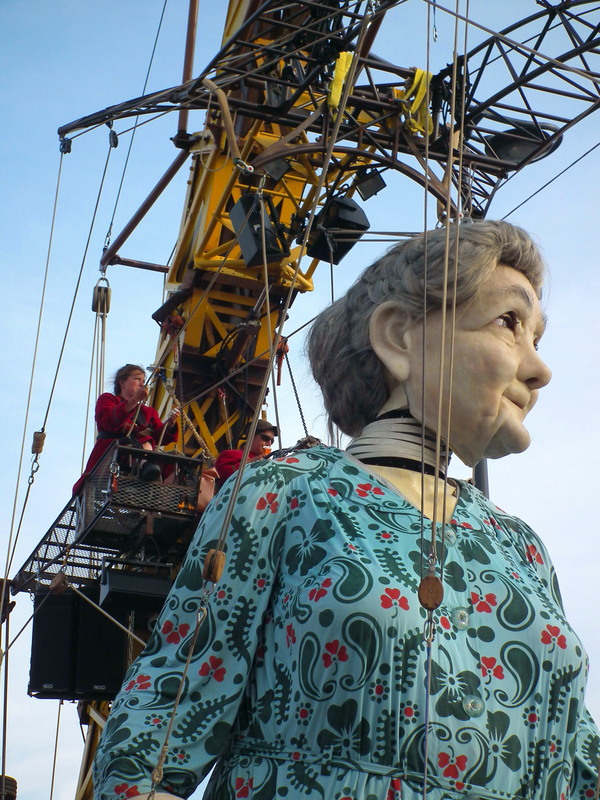 It’ll be topped with a pair of herons and filled with a mechanical bestiary including ants, aphids, spiders and a caterpillar, all of which visitors will be able to ride. What excites me more is that it will be a living, breathing structure with plants rooted within it, their foliage overhanging. Sixty-five botanical gardens from around the world have sent seeds. The photos below are of the Machine Gallery that contains small scale prototypes of the machines and a test version of a branch. 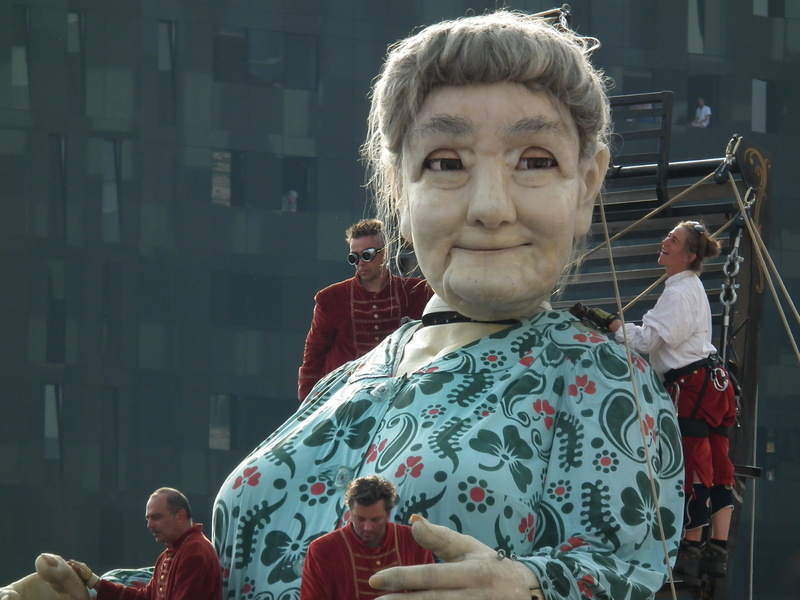 I was lucky enough to be in Liverpool for Royal de Luxe’s Memories Of August 2014. 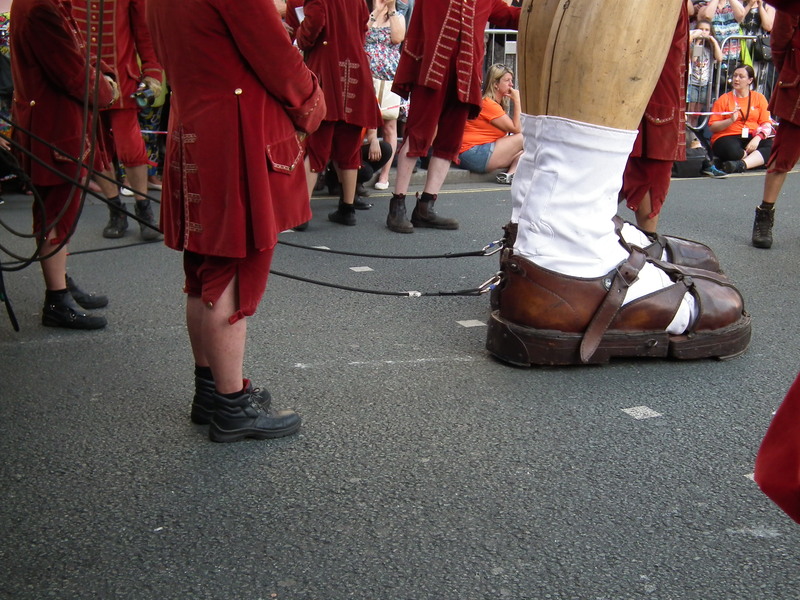 The event was to mark the centenary of the start of World War One. 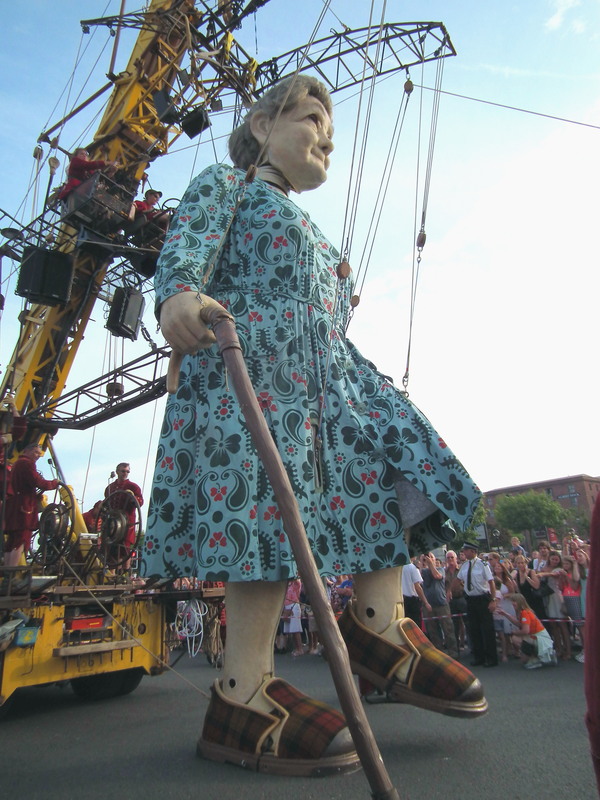 The Grandmother, the Little Girl Giant and Xolo the dog toured the city to tell the stories of the Liverpool Pals, the battalion of 5000 local men who signed up to serve. Of these, 2800 died. 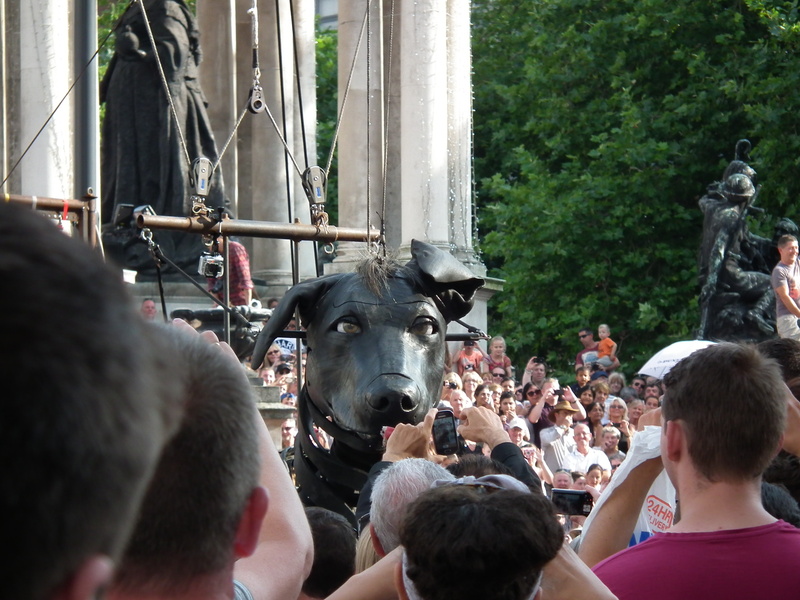 Royal de Luxe are a French company who produce amazing mechanical marionette street events on a huge scale. 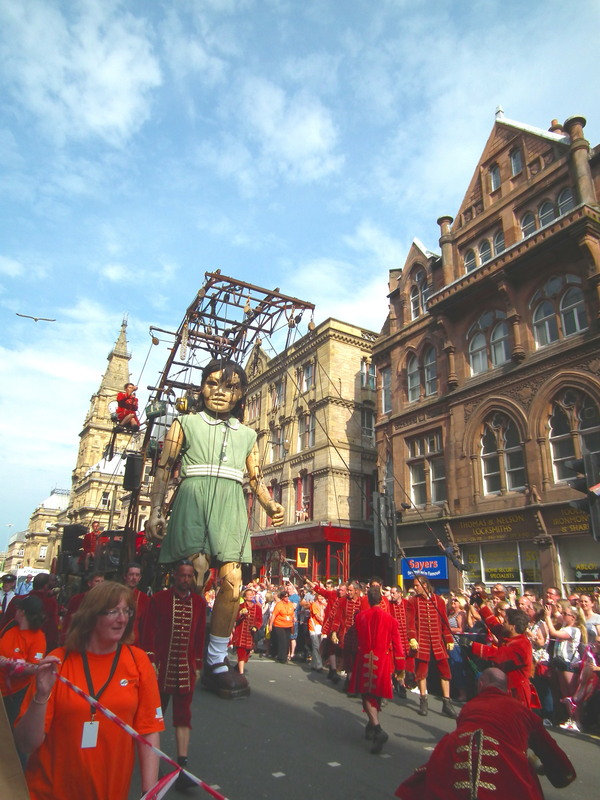 “Memories of August 2014” promises to be an amazing piece of street theatre that will be in Liverpool, UK from 23rd to 27th July 2014 to commerate the centenary of World War 1. 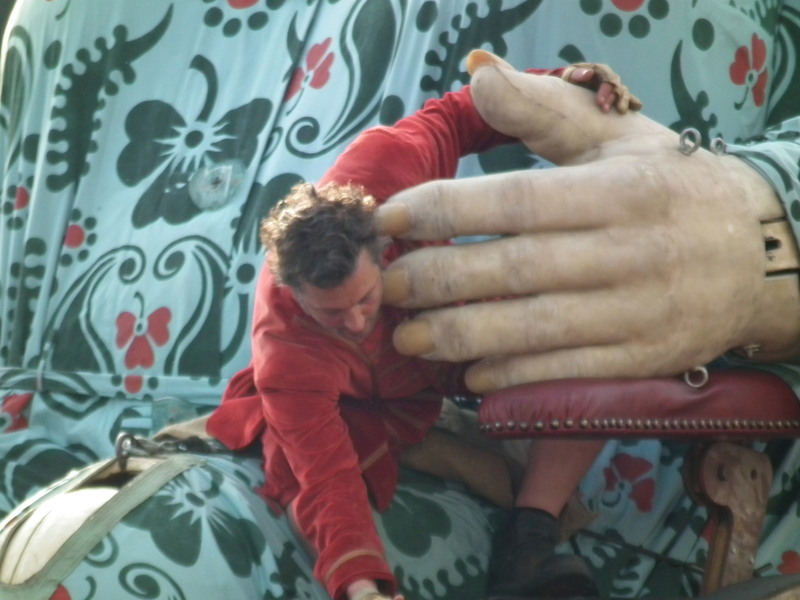 It’s the brain child of Jean-Luc Courcoult’s company, Royal de Luxe. 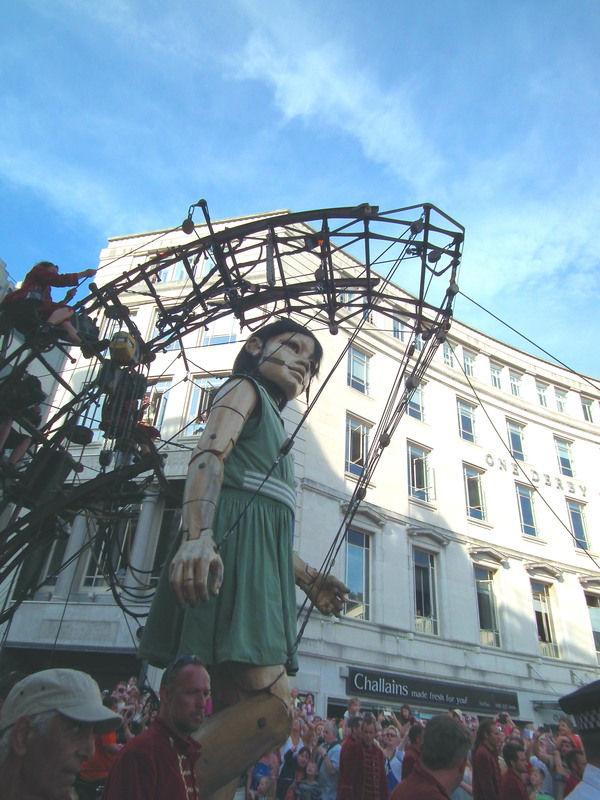 Their creations are amazing, including La Princesse ( a mechanical 50 foot spider) and The Sultan’s Elephant (that takes 22 people to operate it). 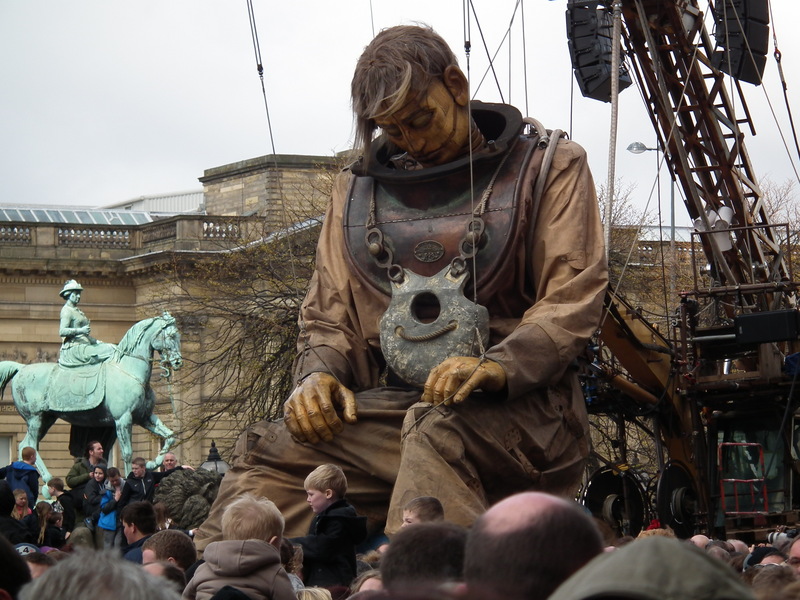 I was lucky enough to see Sea Odyssey, Royal de Luxe’s three day event staged in Liverpool to mark the 100th year anniversary of the sailing of The Titanic. 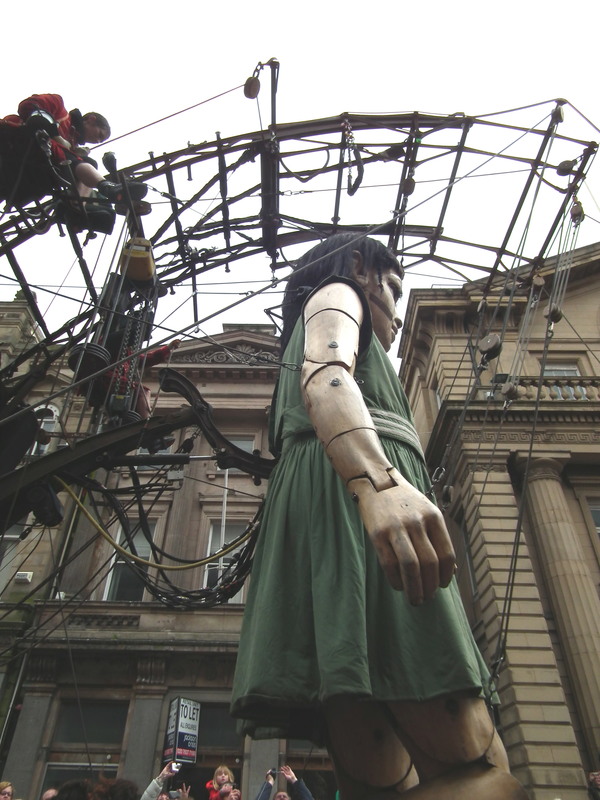 It was inspired by a letter written by a 10-year-old girl, May McMurray, in 1912 to her father William, a bedroom steward on the Titanic who did not survive the sinking. The letter did not arrive until after the Titanic sailed, and was returned to the sender and is now on display at Liverpool’s Maritime Museum. Try and come, if you can. I promise you it’ll be worth it.